Huge opportunities. Transportation is the second largest contributor to climate change and is a major cause of water, soil, and air pollution. Our current transportation system, which relies heavily on motor vehicles powered by petroleum-based fuels, comes with substantial costs to our health and to the environment. On top of emitting climate-warming greenhouse gases, transportation also contributes to injury and illness from motor vehicle collisions and long term sedentary behavior. Significant reductions in illness and deaths can be achieved if we improve our transportation system— that’s where you, the health professional, comes in! 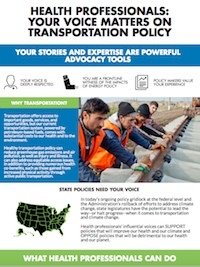 We need your prominent voice in transportation policy conversations. 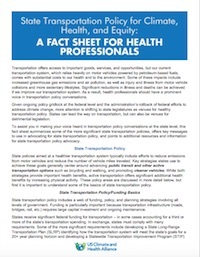 As a health professional, you have an important voice to bring to state transportation policy conversations. You witness the health impacts of transportation policies and funding strategies (e.g. social and medical isolation due to lack of transit-oriented development). Your professional experience and on-the-ground stories are the best advocacy tools you have to influence decision-makers—we’re here to help you use the experience you already have to support healthier policies. The infographic gives you a more general visual representation of why health professionals need to be involved in renewable energy decisions. This is a great tool to spread the word on this issue and to talk about how you’ll be taking action.